“Satisfyingly the origins of Carnival are as shrouded in mystery as everything else in this period. The first references to the festivities taking place before Easter, can be traced as far back as 1094”. This is how we started the last Truly Venice Article on carnival (read more here), and of course nothing has changed on this front. Carnival and its origins still remain unclear but nevertheless are celebrated animatedly year after year. Whilst every year brings something slightly different, there are some traditions, the essential pillars of carnival that we hope will never change. 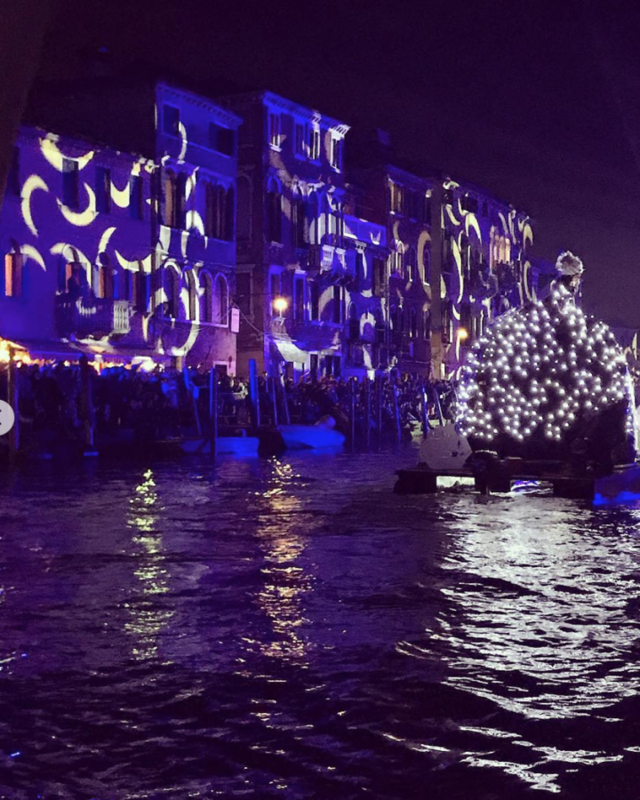 These include the opening Cannaregio procession, the flight of the Angel in San Mark’s square, the ‘twelve Maries’ and of course the Fritelle. (Recipe here). 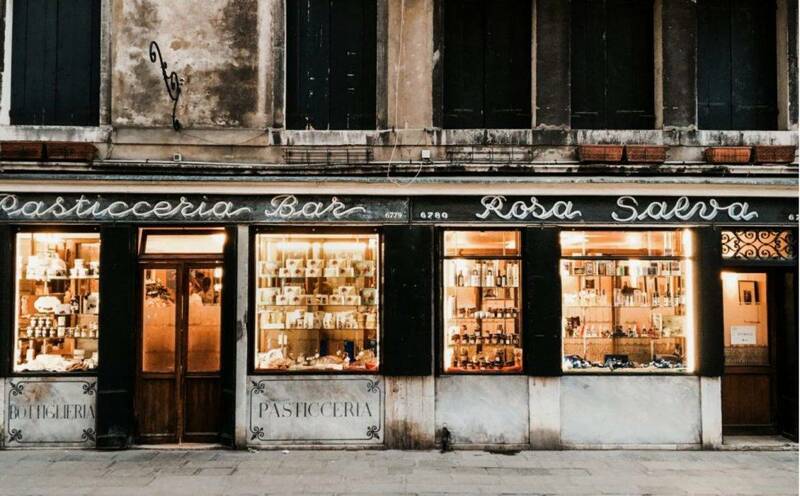 Dal Mas, Dal Nono Colussi, Rosa Salva, Tonolo and Nobile are some of our favourites, but really you can’t go to far wrong anywhere. Originally, carnival was a festival held in the streets. 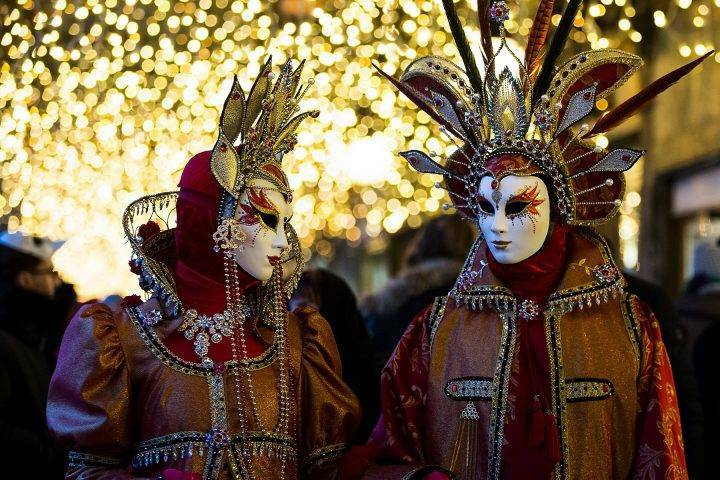 Venetians dressed in masks and costumes, revelling all day and night in their animosity (read more about the masks of Venice). This at least explains why the rest of the world are so attracted to the idea of carnival. 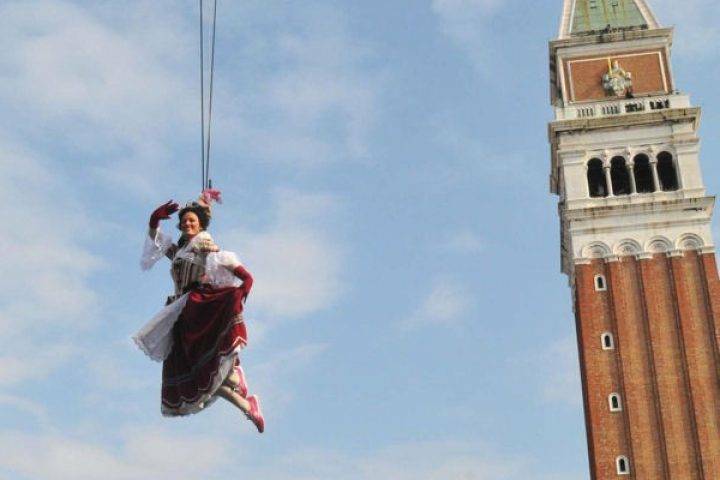 As otherwise essentially it is a very local festival with traditions such as the 12 Marias, that are unique to Venice’s history alone. Over the last few years however, there has been a slight shift to host exclusive parties in spectacular palazzos. But we believe that the fun of Carnival is still to be found walking through the calles, past the sweet pasticerrias, watching tiny children dressed as unicorns, and elegant Signore in embroidered gowns and feather-plumed hair. The real events are the ones that we always want to bring your attention. 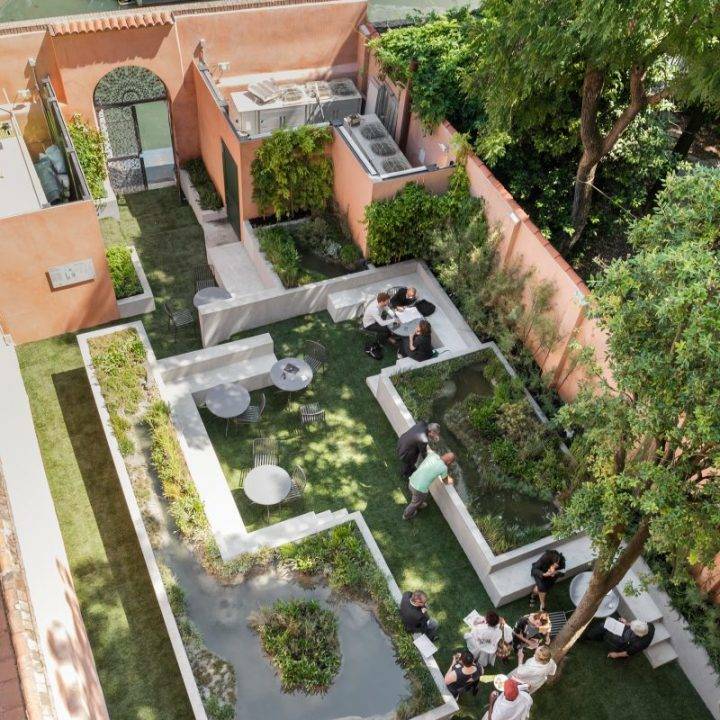 They are open to everyone, and a wonderful combination between spontaneous revelry and hundreds of years of tradition. The opening ceremony of Carnival. 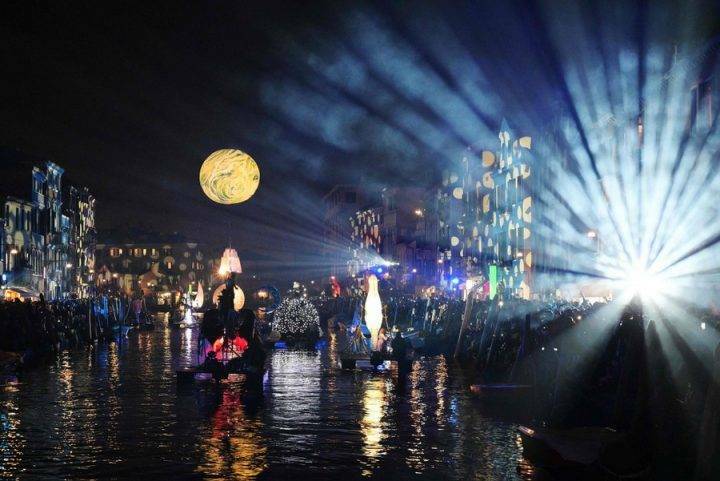 A spectacular flotilla of boats and artists travel along the fondamenta that lines the edge of the Ghetto. Starting at 19.00 and carries on until around 22.00 during which time there is never a moment without something to awe at. 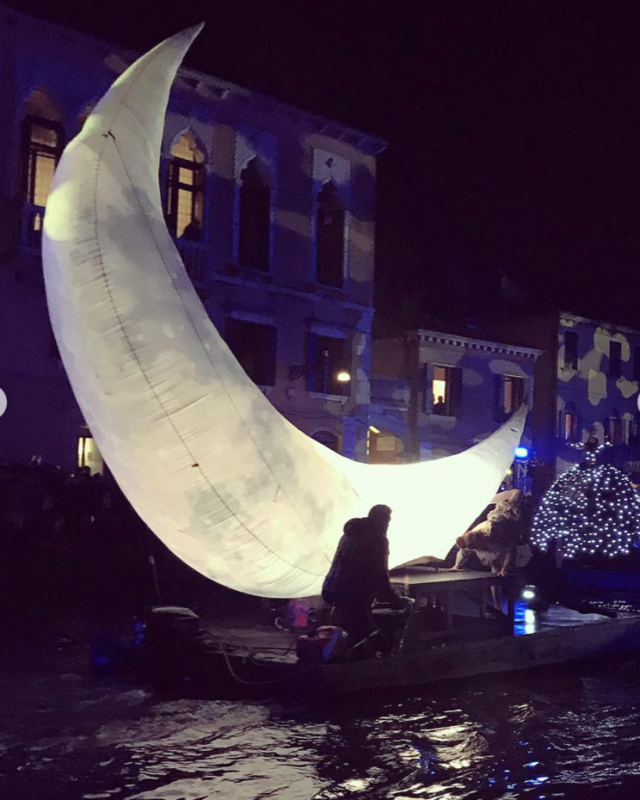 This year the theme was ‘BLAME IT ON THE MOON’, interpreted into dance, design, lights and music all aboard the floating vessels. The highlight for me, was the giant crescent moon that seemed almost pagan in how we adored it. 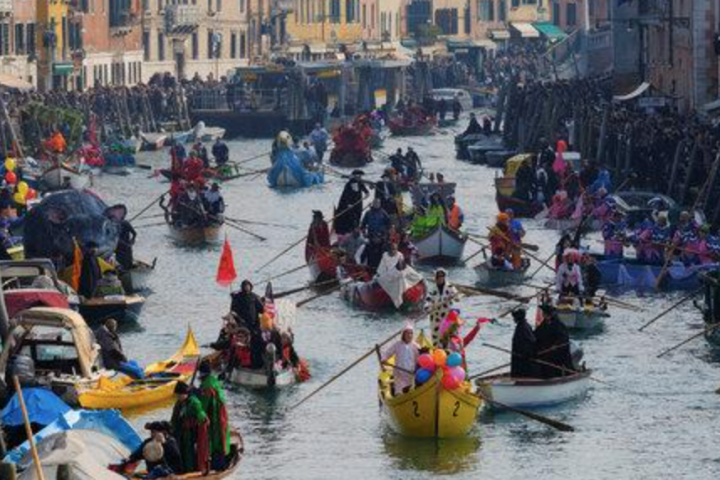 The following day (17th) sees a succession of typical Venetian boats make their way along the Grand Canal. All the participants are usually dressed up in traditional or less traditional attire. 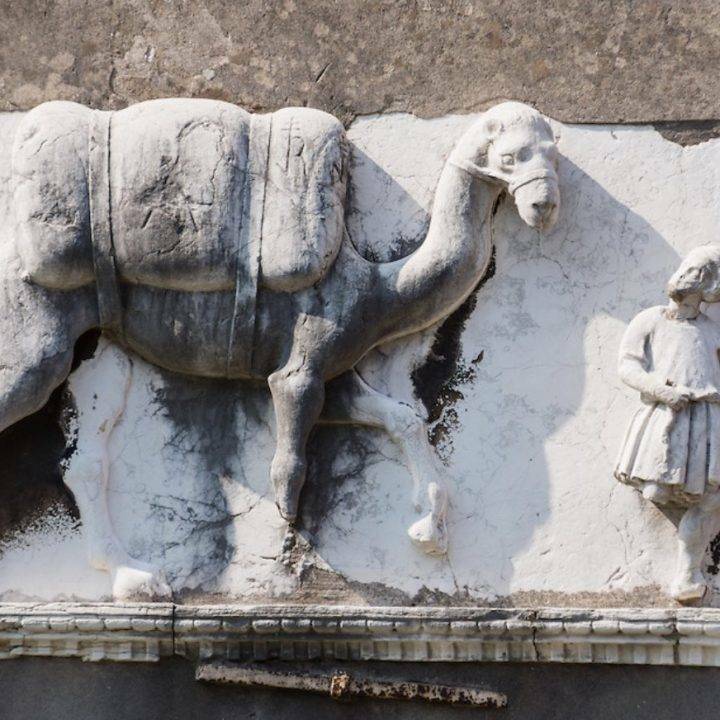 This along with the fact that the Grand Canal is blocked for vaporettos and private motor boats, it is possible to see a fragment of what Venetians would have experienced one hundred years ago. Over 800 boats participated this year. This takes place again in Sant Mark’s square. The roots are due to an event that happened in the mid 16th century. During various exihibitions, a Turkish acrobat did something that stupefied the Venetians. 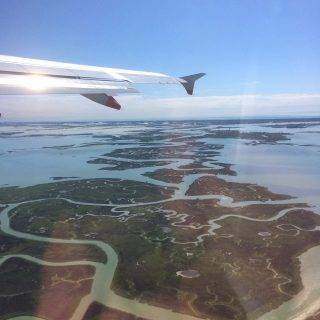 Using only a pole and a wire he crossed from he walked on a rope from a boat tied in Riva degli Schiavoni to the top of St Mark’s Tower and then from the tower to the Doge’s Palace balcony, as a tribute to the doge. There after known as the “Flight of the Turk”. Nowadays the tradition has gone through several changes, and is now known as the “flight of the Angel” as a real person descends on a wire above the crowds. 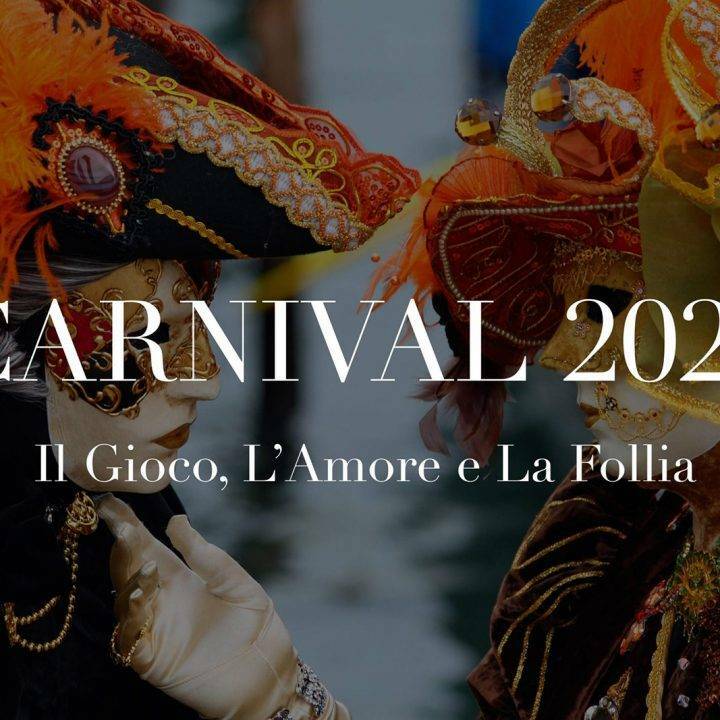 Venice Carnival in February 2019 dedicates this day to a re-enactment of the victory of doge Vitale Michiel II against the patriarch Ulrico of Aquileia and the 12 rebel feudatories, which took place precisely on Fat Thursday of 1162. 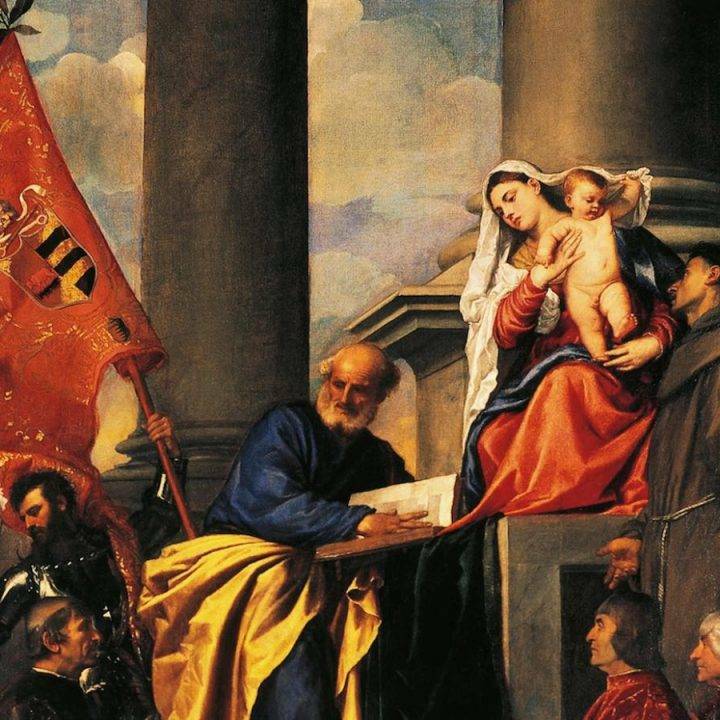 To remember the attempted rebellion quelled with a bloodshed, each year the patriarch’s successors sent 1 bull, 12 loaves and 12 pigs to the Doge, as a gift and compensation. The award ceremony will take place in San Mark’s square between 16.00 -16.30. The official “Maria” of 2019 will be announced and will be passed on by the previous years winner. Martedi Grasso is the last official day of Carnival. It is familiarly known all over the world in Catholic countries as the last day before lent where everyone indulges in fatty foods and breaks the rules. One of the most anticipated days of the year. (Note: In theory this breaking of the rules has been justified in the past as a way of suggesting that the rule breakers are in fact those most pious because it shows that they know the rules). This marks the end of Carnival 2019!